The Vallejo Hobby Paint Sprays are a perfect combination of base coat and highly pigmented color, developed for use on all metal, plastic and resin models and miniatures. 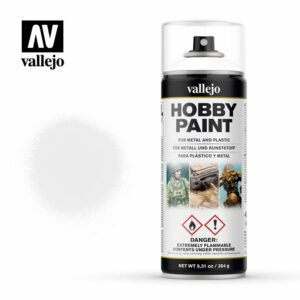 Our new original and unique AV spray formula leaves a perfect matt and self levelling finish, designed to respect and bring forth even finest details of the models and miniatures. The Vallejo Hobby Paint Spray assortment includes 3 Basic colors, 19 Fantasy shades, 5 WWII AFV, 4 WWII Infantry colors and 3 varnishes (34 colors in total). The new Spray Colors are a perfect match to the corresponding shades available in our Game and Model Color ranges, so both painting techniques can be combined. Each Hobby Paint Spray shows the original color applied on the colored ring around the top and is equipped with 2 different nozzles; one with a low discharge flow, especially recommended for fine lines and small details, and the other with a medium discharge flow, recommended for thicker lines and for covering larger surfaces; the low pressure valve allows for excellent spray control. The range is complemented with 3 different varnishes- Gloss, Matt and Satin- recommended for providing extra protection when handling your figures and to give them an overall uniform appearance. The range is available in a 400 ml. / 9,31 oz. / 264 g. can.